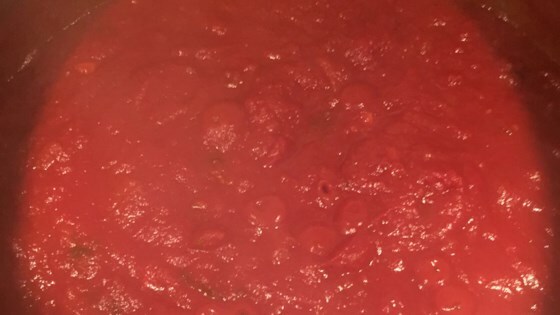 "A simple, slow cooked, authentic spaghetti sauce, as good as the restaurants serve...or better! The secret ingredient is baking soda, but do not taste the sauce right after adding it. Wait a while, and this sauce will not disappoint you. It is good right from the stove, but the flavors blend overnight. Best served with your favorite meatball recipe, where the meatballs cook in the sauce the last half hour. Be prepared to take a nap after eating." Mix together whole tomatoes, tomato sauce, tomato paste, water, mushrooms, onions, garlic, sugar, salt and pepper, basil, and 1 pinch of baking soda in a large saucepan. Bring to a boil, stirring. Reduce to a simmer, and cook for 4 hours minimum. Stir in another pinch of baking soda; the sauce will foam. Simmer, stirring occasionally, until thick and almost brown. Make sure to scrape the sides of the pan in to the sauce. After the sauce is fork consistency, stir in Parmesan cheese. Watch that the cheese does not burn. Taste sauce. If it is too tangy or acidic, add another pinch of baking soda and simmer another 1/2 hour. Cool, cover, and refrigerate overnight. The next day, reheat and serve. See how to make a thick, rich tomato sauce that’s just a bit spicy. You would have to have 8 people with huge appetites for this to be 8 servings. This makes tons of really disgusting looking, bland mushroomy tasting downright gross sauce! Didn't even get one compliment on Mother's Day for this sauce. OUCH!